justify my buying more yarn at some point, for bigger projects. 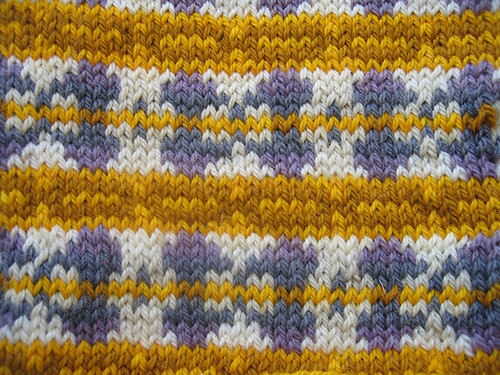 It is double knit, which is too chunky for this climate and me, but it was fun practice, seeing if the colours would work together (they do, but i wouldn’t wear them). Anyways my only barrier right now is not having a pattern I like. So I might have bought a cheap second hand copy of this book, so that I can learn more about the process (this girl has yet to steek, and that seem like the scariest thing you can do in knitting), and to get some ideas of colour designs that would work. In the meantime I have socks keeping me busy, the flower and frost shawl creeping along, a baby jumper than i really need to get on and finish, and a need for 3 1/2mm circular needles so i can actually use a stack of my sock yarn. ← Day 2(late – arse): Sofa! Pretty! I love the idea of using natural dyes. Doubleknit does make a supremely excellent scarf (and you have no backside to look icky with ends hanging out, etc). p.s. love the new couch!